There’s a new approach to an old technique in Boase’s work, one that makes you want to look again with wonder. The 21 exhibits in this solo exhibition were executed over a ten year period which only goes to prove, good art work is worth the wait. 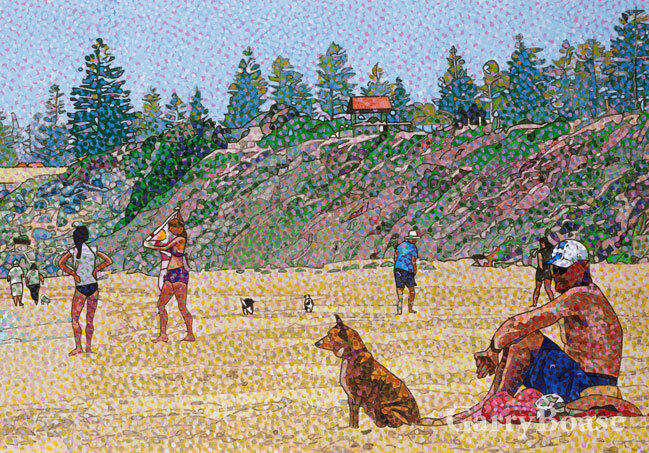 Pointillism is the technique but this artist takes it further then most, to offer stunning effects that seem to glisten and sing the praises of the medium, in this case acrylic on canvas. Boase has a sophisticated style, one that offers an intelligent approach to image making and painting. He goes beyond producing a picture to create painterly compositions that are well constructed with keen attention paid to each aspect of the visual language. An illusion of reality will be found by those who are looking for that quality in a painting. Recognizable subjects of sea and landscapes as well as portraits are beautifully articulated as the artist knows how to draw well. Meanwhile those who prefer the artfrom above the subject matter will also find satisfaction guaranteed. Texture is created by coloured dots and spots then exacerbated by linear intrusions, in the form of solidly drawn contours. Colour divides and conquers the picture plane in a mosaic of vibrant hue that separates sea from sky, shrub from rock, flesh from fabric. On close examination the spots seem like perfect circles, each a separate entity like cells in an organism. From a distance the dots melt into the unity of the subject; the cells now form a coy girl child in Daydream or the living forest seen in Tapestry. After identifying the image you begin to appreciate the melody of the composition, one played against the rhythm of tonal values. Light and dark dances over the surface of the subjects, to activate the surface of the painting and ignite yet another level of appreciation for the art work. Boase captures all the fine attributes associated with visual art, not the least being visual excitement. His is not a unique style but his ability to employ it is unmatched in this town. This is quality work, meticulously executed and finely presented. We look forward to seeing more from this artist.